The main conclusion of this new study seems to be that East Asians have normally more Neanderthal admixture than South or West Eurasians. Also the Maasai from East Africa have been shown to have minor Neanderthal admixture, consistent with the also minor Eurasian genetic component they have. However I fail to see it in the D-statistic graphs, which show less than 15% more Neanderthal admixture in Eastern Asians than in Europeans (on average and discounting error margins, which strongly overlap). It may be therefore another case of hair-splitting. Instead the evidence of weak Neanderthal admixture (via minor Eurasian genetic influence) in the Maasai of East Africa seems more solid: while error margins of Maasai and Luhya do overlap, the main blocs do not. Figure 3. Summary of significance tests for average values of D. Positive values indicate that the second sequence is more similar to the Neanderthal genome than the first sequence. In all parts, the box plots indicate the range of D values obtained for pairs of individuals from the populations indicated. 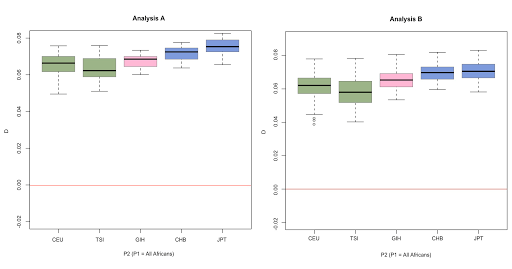 Parts A and B are box plots of individual D statistics computed for each individual from the specified population compared with each Yoruban. The p values are from the randomization test, Test 1, of significant differences in the average D values for different pairs of populations. Parts C and D show box plots of individual D statistics computed for every pair of individuals in the specified populations. The p values are from the randomization test, Test 2, of significant differences of the average D from 0. See also Table 2. CEU or TSI (Europeans, green), CHB or JPT (East Asians, blue), or GIH (South Asian, pink) (PDF, 222 KB). Founder effect among East Asians, known to have less overall genetic diversity and suspected to have undergone some extra (mild?) bottleneck at their ancient origins. Low-level African (and surely also early OoA residuals from West Asia) admixture among West Eurasians, notably Tuscans (TSI) in these samples but also to some extent all Europeans (incl. CEU). This has the effect of increasing genetic diversity but also of slightly diluting Neanderthal admixture. The control here are Indians (GIH), which show slightly more Neanderthal admixture than Europeans (but are still closer to these than to East Asians also in this aspect). Indians (who don’t seem to have any post-OoA African admixture, unlike Europeans and West Asians, who have it at variable low levels) suggest that factor #2 (dilution) weights only somewhat and therefore that factor #1 (East Asian founder effect) must be considered the main one instead. But, unless someone can point me where I am wrong, I fail to see neither the alleged 40% excess Neanderthal admixture in Orientals nor why would these results question the single admixture episode (or period) at the origins of migration out of Africa (OoA). 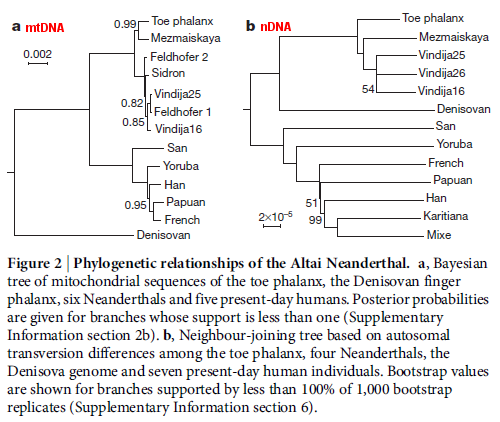 To finish this entry, it must be mentioned that the authors could only detect at most the tiniest fraction of Denisovan admixture among the sampled populations (i.e. nothing relevant and with no regional differences). 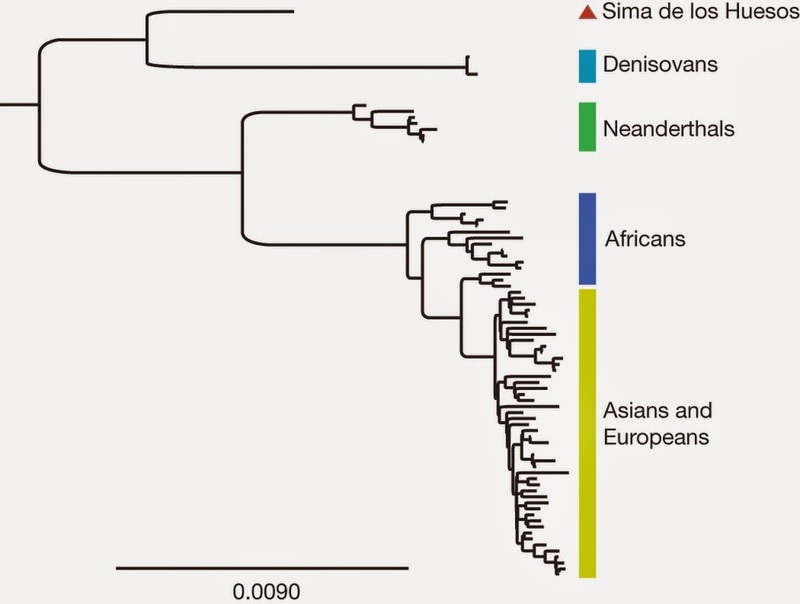 However they did not research, admittedly, the South China populations suggested to have slight more Denisovan input by Skoglund and Jakobsson 2011. 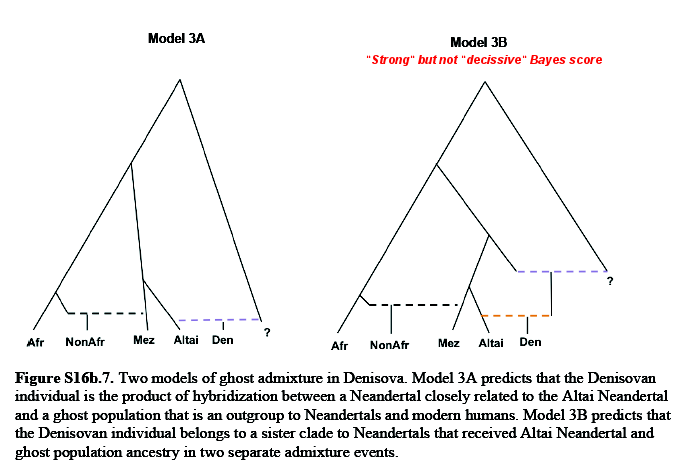 Splitting hairs on the Neanderthal affinity, questioning if the slight greater Neanderthal admixture detected by John Hawks among Europeans (the opposite of what is claimed here) was actually meaningful at all. The genetic study of the ancient man of Tianyuan is already online, as I commented yesterday in a quick update. And the old guy (or is it a woman?) happened to carry the matrilineage (mtDNA) B, more specifically B4’5, defined by a relatively long deleted block at positions 8281-8289 (this excludes B6 now linked with R11 and also the other relative of all them R24, see PhyloTree for details). However within B4’5 the lineage could not further be resolved within the modern haplogroups, so it is neither B4 nor B5 but a third branch of the same haplogroup. The authors actually talk of “haplogroup B” but they explicitly mention a deletion of a 9-bp motif (5′-CCCCCTCTA-3′, revised Cambridge reference sequence positions 8,281–8,289) as well as a substitution at position 16,189, what makes it unmistakable B4’5 per the current PhyloTree build. The tree to the right illustrates this fact, placing Tianyuan man’s lineage hanging directly from the root of this haplogroup that, beyond reasonable doubt, coalesced somewhere in East Asia (probably SE Asia, with Laos and Hainan being good references judging on diversity) some time before this person lived and died near what today is Beijing. What does it tell us? Really nothing new, at least within the parameters I have been managing: it confirms that the expansion of mtDNA B4’5 was already happening back in that time and that it had reached more or less its current area of expansion in East Asia (American and Oceanian B variants expanded later, of course). It also implies that its ancestors R and N, which experienced important successive expansions in the course of the colonization of Eurasia by our species had expanded at an even earlier date (again nothing new to me but a nice confirmation anyhow). On the other hand, this person’s particular matrilineage went eventually extinct later on. This again does not tell us too much because it is something to expect with the course of time, especially at low population densities, as was the case in the Paleolithic. He can still be ancestral to modern peoples in the area and elsewhere but not by a purely mother-to-daughter line – at least not that we know. Because of the poor state of the DNA, the researchers had a difficult time sequencing it (technical details in the paper), however they managed to reconstruct a good deal of chromosome 21, which they used to compare with modern humans and also with Neanderthals and the so-called Denisovans. The result places Tianyuan closer to modern Far Eastern populations than to the rest of modern humans. This clearly indicates that the process of division in various more or less homogeneous subcontinental-sized populations was already somewhat advanced. Fig. 2. 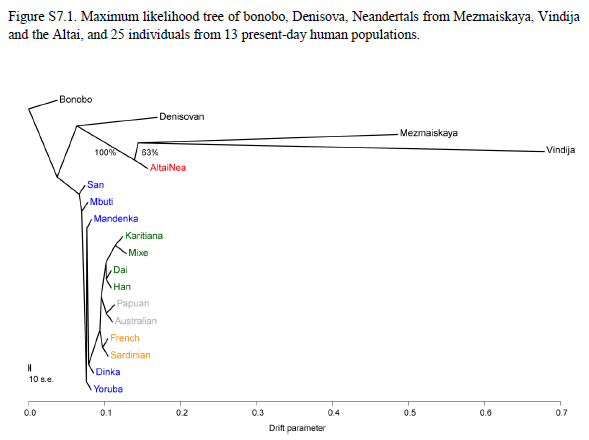 Maximum-likelihood tree relating the chromosome 21 sequences of the Tianyuan individual, 11 present-day humans, and the Denisovan genome. The most strongly supported gene-flow event is shown in yellow. Bootstrap support for all internal edges is 100% except for the edge putting Tianyuan outside the four Asians, which is 31%. The scale bar shows 10 times the average standard error of the entries in the covariance matrix. We note, however, that the relationship of the Tianyuan and Papuan individuals is not resolved (bootstrap support 31%). 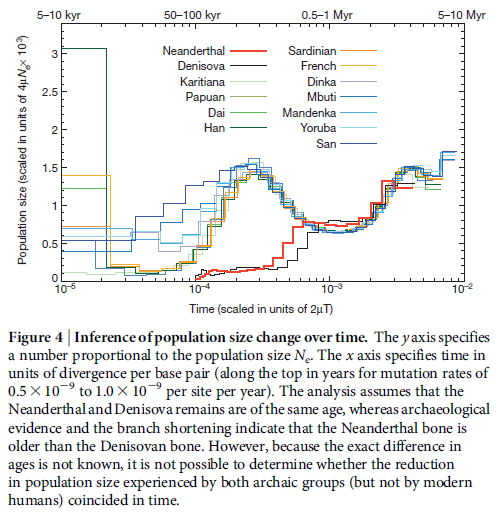 Further work is necessary to clarify whether this reflects the age of the Tianyuan individual relative to the divergence between modern human populations. The caveat is particularly relevant because the colonization of New Guinea is at least as old as 49,000 years ago, some ten millennia before Tianyuan, what does not fit too well with the tree at that level of detail, assuming (as I do) that modern Papuans are direct unmixed descendants of those early settlers. Papuans do carry at high frequencies a related matrilineage (P also basal descendant from R) but that is also true of modern Europeans and they appear more distant in the tree above. Here we can appreciate the differences and proximities by another measure. The closest compared modern person to Tianyuan man is a Karitiana, followed closely by the Han and, surprisingly, by the Sardinian and the French, and only then the Dai and Papuan. The distance of the Karitiana to Tianyuan man is still greater than that with not just the Han or the Dai but also the Europeans. However this can be argued to be because Native Americans must have a deep dual East Asian and West Eurasian origin, the latter via Altai (Y-DNA Q, mtDNA X2). Let’s check the Han then, who are not believed to have any meaningful West Eurasian admixture. Curiously the paradox happens again: the Han is somewhat closer to Europeans by this measure than to Tianyuan, and even their comparison with the Papuan shows up slightly less differentiated. This is admittedly harder to explain but we can conclude that either (a) this method can only grasp affinity/divergence to some degree or (b) that the Tianyuan partial genome indicates a very preliminary level of continental differentiation. Or (c) both. Of course time is the main cause of genetic differentiation and by no means we can imagine that such an ancient individual would be too similar to his modern plausible descendants but, on the other hand, all (including Tianyuan mtDNA) indicates that the process of continental differentiation was already well developed 40,000 years ago (most European ancestry must come from people living in Europe or West Asia back then) so we can either blame subtle flows like Siberian migrations that have kept both genetic pools somewhat closer than in pure isolation or we must assume that the measure is not too exact. The paper also deals with Denisovan and Neanderthal admixture, finding that Tianyuan man was within the modern range for both parameters in East Asia. 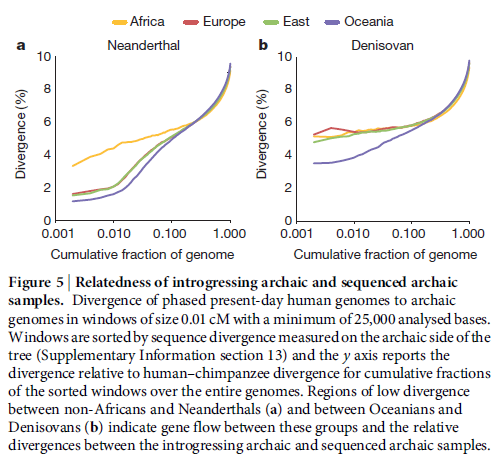 This is very important because it ratifies the mainstream model of two minor admixture episodes: (1) with Neanderthals at the exit from Africa and prior to the Great Eurasian Expansion (so all non-Africans, including Tianyuan man, have very similar levels of Neanderthal admixture today) and (2) with a relative of Denisovans (Homo erectus?) maybe in Indonesia affecting only (or almost only) the aboriginal peoples of Oceania (and Filipino Negritos but not the other so-called Negritos from Malaysia or the Andaman, who are not particularly related anyhow). 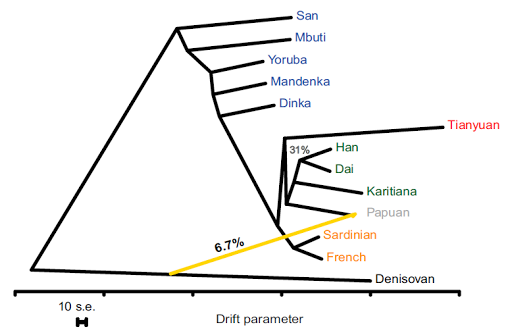 (As a side note notice that the Denisovan-like gene flow into Papuans in fig. 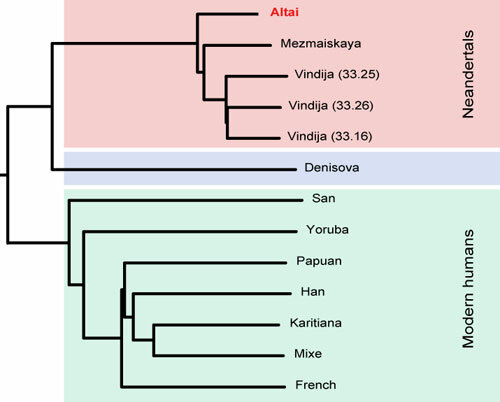 2 appears to hang not from the end of the branch but from a very high position, suggesting it was a relative and not the known Denisovans of Altai themselves who became admixed into Papuans and other Oceanian populations, probably a relative living in the route to Australasia). Update: Marnie just published a mention of a previous work on Tianyuan 1, which focuses on the isotopic evidence for a fish-based diet. 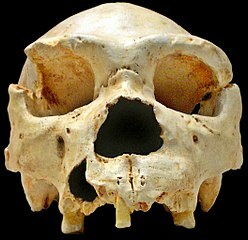 The information is sketchy as of now but the news in the press indicate that an Homo sapiens from Tianyuan Cave, near Beijing, whose fragmented remains were discovered in 2003, was closely related to modern East Asians and Native Americans. The paper is not yet online but the information released to the media strongly suggests that East Asians were already distinct from other populations some 40,000 years ago. This would seem to be based on the sequencing of the mitochondrial DNA and the explicit mention of Native Americans indicates that the lineage must be A, B, C or D (X, the fifth and less common matrilineage of Native Americans, is not found in East Asians, with some exceptions from Siberia, so we can exclude it safely). Planck Institute for Evolutionary Anthropology in Leipzig, Germany. This would seem to discard some adventurous hypothesis floating around about tremendous demographic changes in the Paleolithic and afterwards, at least for this region. Probably not even when “mode 4” technology arrived to the region (from Altai) c. 30,000 years ago. In other words: the seeds of modern populations were already there c. 40,000 years ago in East Asia (and surely also in most other regions) and, even if they may have changed somewhat, they have remained the same at least to some notable degree. genes as living Asians do (SN: 8/25/12, p. 22), the scientists report online January 21 in the Proceedings of the National Academy of Sciences. 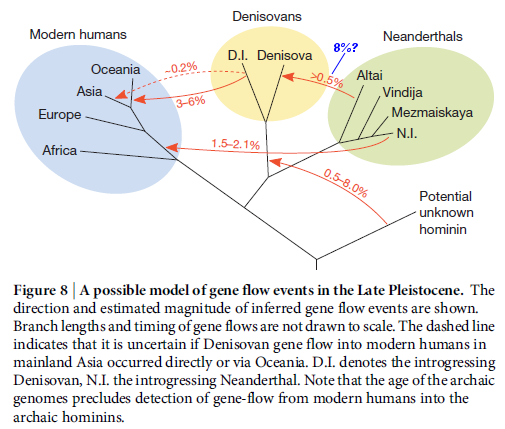 This also seems to discard models implying Denisovan admixture happening in Siberia or NE Asia and would indirectly support my own hypothesis of admixture with Homo erectus (for which Denisovans, plausibly an Erectus-Neanderthal hybrid, would be just a proxy) in or near Indonesia. Sources: Science News, Max Plank Institute. Update (Jan 22): the paper is already online and is open access (cool!) 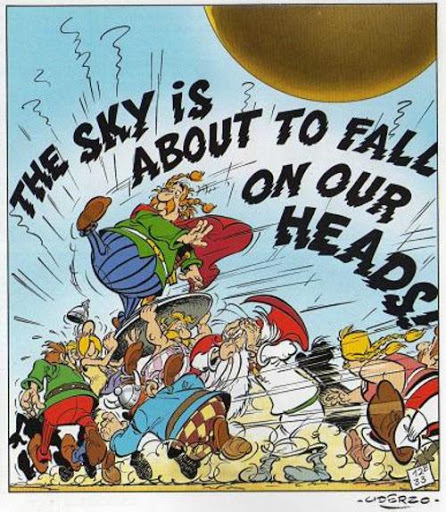 I don’t think I have time to discuss it today but will do tomorrow without doubt (other than the sky falls on my head, you know).